The design of the Amish Signature Mission Work Desk displays everything you love about mission style furniture. The simplicity of the design combined with the durability and beauty of the features makes this a desk strong enough to support your work while it looks beautiful enough to be displayed in a museum. 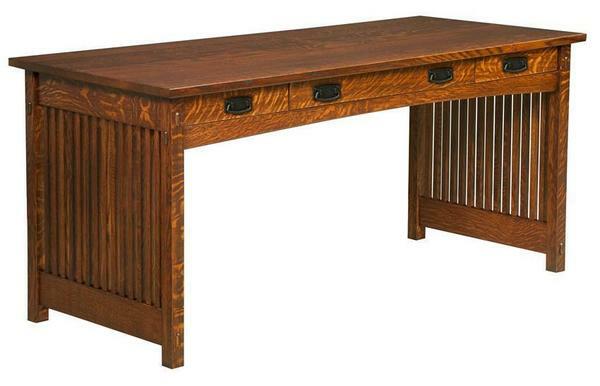 Handcrafted by the Amish, this mission desk is heirloom quality you can count on. Long mission slatwork frames each side while the slender drawers open to reveal a keyboard tray and two pencil drawers. This mission desk is pictured in the lovely quarter sawn white oak wood with burnt umber stain. Quarter sawn white oak wood offers a wood selection that is resistant to cupping and warping, providing a strength that will serve your office furniture collection well throughout the years. We combine the perfect amount of form and function to bring you a custom made desk you'll love. All the details that make Amish furniture a trusted and true product are included in this design. Dovetailed drawers offer strength and space while the premium hardwood used to make the desk is the best you can buy. Our goal is to provide your home furniture collection with furniture that works for you while looking beautiful doing so. Consider these customization options to make this mission desk your own. Build a complete work station by combining all three Signature Mission Office Desk pieces including this credenza to create a complete corner writers desk and storage credenza office space. Contact one of our knowledgeable furniture specialists today with any questions or for custom ordering assistance. Height from Floor to Bottom Rail Under Center Drawer: 25 ½"
28" x 28" Corner Unit Dimensions. I received the lateral file cabinet that you replaced for me. Thank you very much. It is perfect. I am happy to work with such a responsible company, and plan to order from you again.